The tendrils of smoke trickled their way through the thick, hazy air of a smog-ridden sunset. The acrid odor of melting chemicals permeates through my pollution mask as I speed past the piles of burning plastic along the roadside. This is rush hour traffic in Hanoi, Vietnam. The intense overload of deafening horns, exhaust fumes, and humid air have become a familiar sensory backdrop, however, the pungent smell of burning garbage cannot be likened. Sundown in Tay Ho, Hanoi. The pink haze is a combination of smog and sunset. I frequently notice these piles of burning garbage. This method of waste disposal is not a foreign sight to me. I can’t help but wonder, why would one choose to burn off such materials? Are they aware of not only the health effects of such actions but the overall impacts of these emissions to the future of the planet? 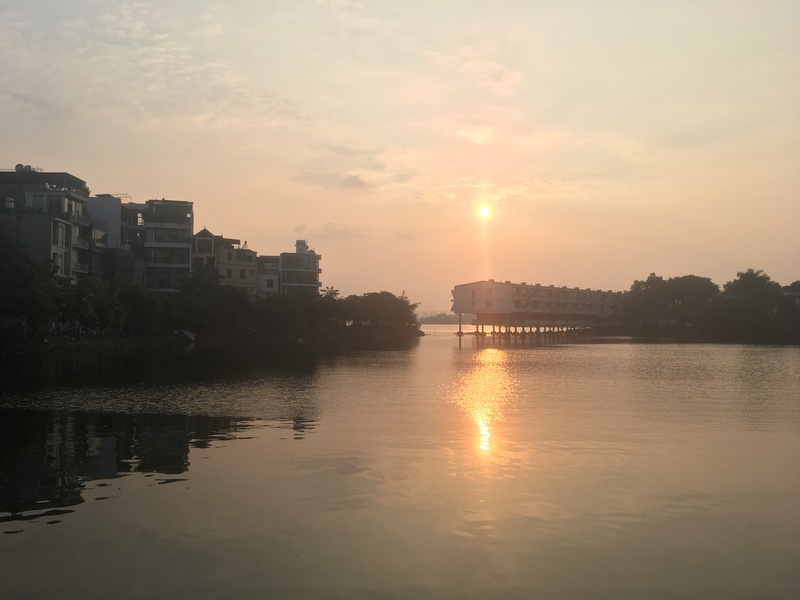 According to the World Health Organization, the average air quality pollution of Hanoi is five times higher than what is deemed acceptable for human health. In 2016, data published by the WHO showed a direct link of 60,000 premature deaths yearly due to air pollution in Vietnam. An abandoned trolley typically used by informal trash collectors. Boxes across the street from my house that have been repurposed as tree planters. I think upcycling has been practiced here way before it was trendy. This form of waste management is common in a country in the Global South, where there is no centralized waste management system, and in a city like Hanoi that races to meet the demands of its skyrocketing urban population, many informal labourers, referred to here as ‘waste pickers’ have become a primary driving force in the waste management sector. I attended a conference in September hosted by the International Union for Conservation Nature (IUCN) Vietnam, entitled “Identifying Stakeholders and Fencing Policy Challenges in Plastic Waste Management in Vietnam”. This workshop focused on bringing government, civil society, private corporations and several other actors together to find a solution to waste management issues in Hanoi. Overall, I couldn’t help but agreed with the conclusions made by the present stakeholders – there is a gross mistreatment of waste workers. 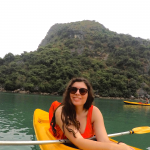 In addition, there is an issue that needed to be brought to the forefront of the discussion and that is, that there needs to be a more fitting way to address plastic waste pollution in Vietnam. 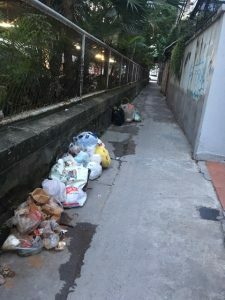 Garbage day is every day in Hanoi. Residents will leave their garbage outside their houses to be picked through and sorted by informal waste pickers. All remnants of garbage will be gone before night. According to the Environmental Development Action in the Third World (ENDA) Vietnam, a speaker at the conference discussed the issue of social equity in plastic waste management and the fact that women waste pickers face numerous challenges related to waste handling. Their work is not always recognized for the environmental and economic benefits it brings to a city. In the case of Vietnam’s waste pickers, women play a significant role in all stages of collection, sorting, recycling, and treatment of waste. 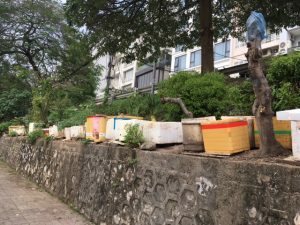 According to an estimation in 2001 by Dang Kim Chi, from the Hanoi Polytechnic University, women accounted for 60-80% of the total number of employees in urban environmental enterprises. Some of the potential challenges that contribute to these barriers are the majority of women’s household roles and domestic responsibilities as caretakers, cooks, and cleaners. Outside of the household, it is also common for women to participate in the informal waste sector at the lowest level as their skills and credentials do not extend beyond informal labour, and therefore disproportionately represent those employed in the waste sector. I sat down with the director of my organization, the Centre for Marine life Conservation and Community Development, Ms. Hue, who recounted the experiences of Ms. Huyền, a woman who presently works within MCD as a cleaner, who from 2012-2016 had been a waste picker herself. 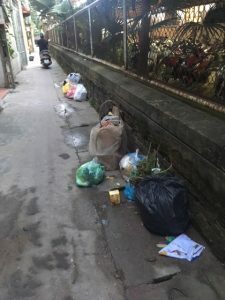 Ms. Huyền had spoken with Ms. Hue on several instances about her time as a waste picker and during this, she had recounted some key issues with the waste management system in Vietnam. This includes working within the restrictions of middle-men, who would purchase high-valued waste items such as recyclable metals, glass, and high-quality plastics at far below cost. Women waste pickers’ often experience gender inequalities with prices being set by male buyers, little bargaining power, and overall less recognition compared to their male counterparts. The remaining trash that could not be sold and was of no monetary value would have to be disposed of by the women themselves, and in most instances, the cheapest and most convenient option was by incineration. There is also the physical factor of strenuous labour within non-existent labour standards which results in vulnerability to hazardous waste and poor sanitation. In 2016, Ms. Huyền’s mother passed due to the nature of the overall risk of her job as a waste picker. I discussed these issues and barriers with Ms. Hue, the government and different stakeholders that do not intervene but instead greatly benefit from the cheap, efficient, and autonomous informal waste management. It’s very easy to acknowledge these impacts, as I’m sure many others have foreseen the potential complications of waste pollution in Hanoi. 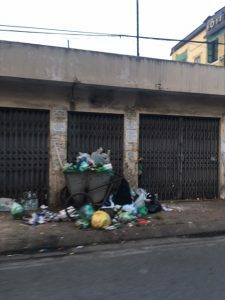 Additionally, the narrative of economic and social inequity for a vulnerable group such as women in waste management can be easily generalized. Ms. Huyền’s story is one of many examples of marginalized workers whose family moved from a rural area to work in the informal economy, nevertheless, it represents much more than just a marginalized labourer supplementing an income. As she said, “waste-picking fed me and the lives of hundreds of other women doing the same. It cannot be replaced by government or companies because it is so well organized,” therefore it represents a case far more complex in magnitude and in scale. These women represent stories of entrepreneurship and resiliency. They have seen opportunities to generate livelihoods through informal means, therefore, creating networks of relationships to address these supply-demand gaps in Hanoi’s waste management infrastructure. As I continue to learn more about this topic, the overarching solution for improved welfare and social security of informal workers only further reveals itself in those who most heavily represent it: women and girls.